We have long believed that novels and food are a perfect match. Especially when planning a book club get together. Which is why we’ve been looking for a food blogger to create a dish inspired by each month’s featured selection. But it couldn’t be just anyone. Our dream blogger would be as savvy about books as she was about food. Lucky for us, we found Ingrid, founder of Edible Tapestry. Gumbo would have been a given. It would have been easy to choose jambalaya or crawdads or beignets when creating a recipe around a book set in coastal Louisiana. But midway through reading Bonaventure’s story, my heart, which had been stolen by this little fellow on page one, was set on the idea of making Shoo Fly Marmalade for my first post as the She Reads food blogger. It must be Shoo Fly Marmalade, I kept thinking, as I turned page after page of The Silence of Bonaventure Arrow . There were so many aspects of the marmalade spoon scene that spoke to me of who Bonaventure was; of what went through his very special mind, minute by minute, that it became one of my favorite moments in the book. Fortunately, it was also one I could try to emulate with a recipe. One that would bring something tangible to the lives of those of us who adore Bonaventure and appreciate the glimpse Rita Leganski has allowed us to have into his very unique life. So I set to work. 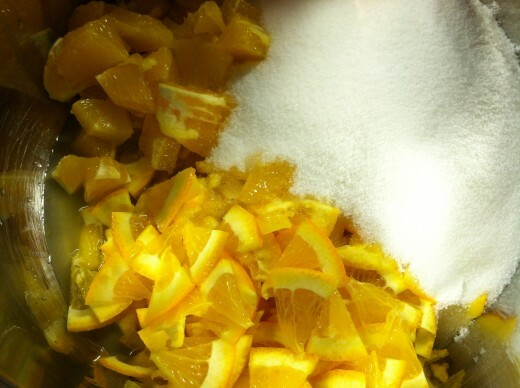 The recipe I came up with is very simple, even for someone who had never before attempted to make marmalade. Chutney, compotes, jellies, jams…yes. Marmalade? Nope. Did I need to add pectin? Would I be doing the dreaded soft ball stage test? As it tuns out, I was able to ignore my pot of simmering ingredients on the back burner of my stove and go about my business. 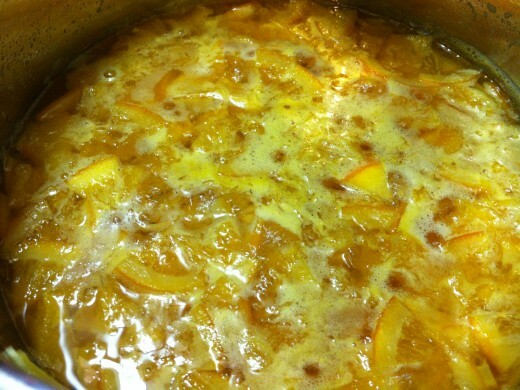 At the end of two hours I had marmalade! Now I’m wondering if I’ll ever buy jelly from the store again. Surely there will be a jar or two of Shoo Fly Marmalade in the fridge or pantry from this day forward. Just four ingredients and the time it takes to watch a chick flick, and you’ll be shooing flies from your marmalade jar too. 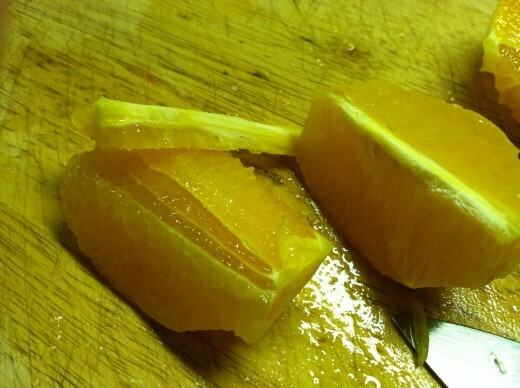 Take two of the oranges and half, quarter, or wedge them, leaving the rinds intact. With a sharp knife, cut them into very, very thin slices. 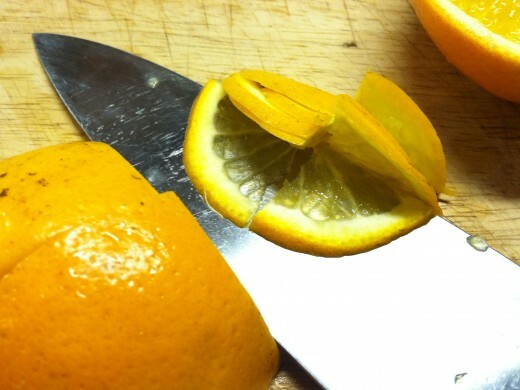 Peel and quarter the remaining three oranges. 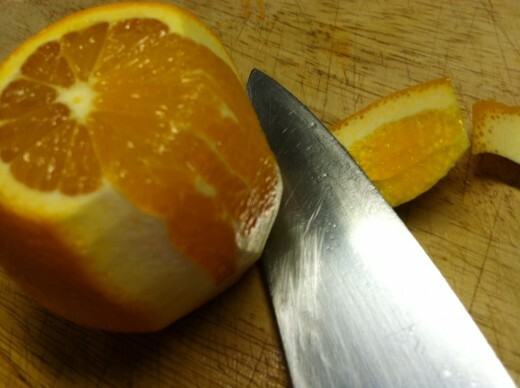 Cutting the rind off the orange will eliminate the white pith that can add bitterness to dishes. 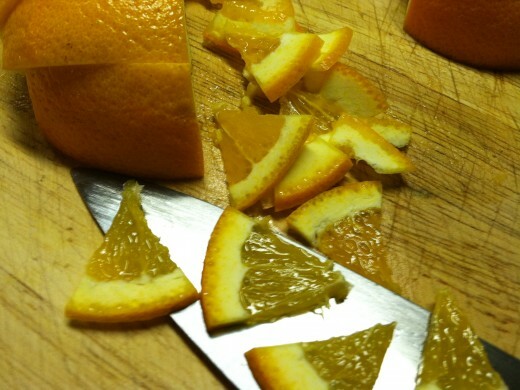 Trim the center membrane from the wedges to avoid tough chunks in the finished marmalade. 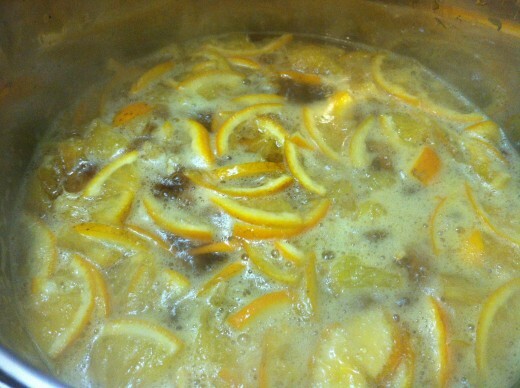 Place all the orange slices and wedges in a medium saucepan or small stock pot. 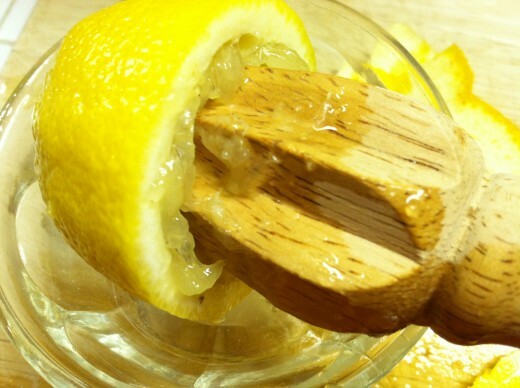 Add in the lemon juice, water, and sugar. Stir well to combine. Bring the mixture to a boil. Reduce the heat to a very low, bubbling simmer. I have two rambunctious older boys so set mine on a back burner for safe keeping. 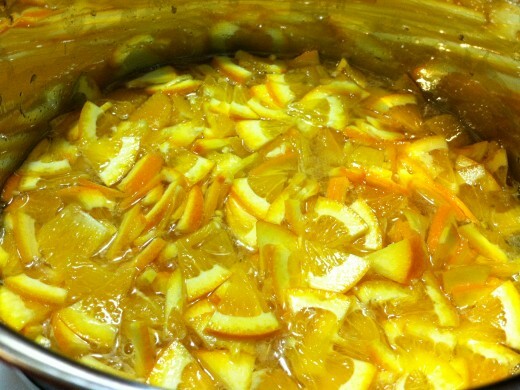 You can look at it all you want, but you probably won’t have to stir or touch your simmering marmalade until near the end of the two hours when it begins to get very thick and sticky. 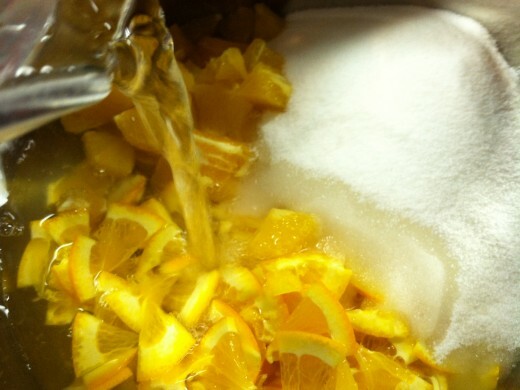 Also, reduction time may take a bit longer, depending on the size and juice content of your citrus fruits. I made two batches of marmalade. In the first I added turbinado sugar, which is what I typically use in my baking. 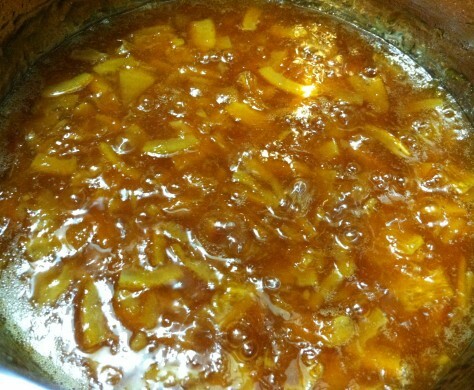 The finished marmalade was a dark golden color with bits of bright candied orange zest throughout, and took two hours on the nose to congeal. I decided, however, that it just didn’t look Shoo Fly Marmalade enough for me so I bought white granulated sugar that I usually reserve for birthday cakes and holiday baking and tried again. That batch looked exactly as I expected it to look, all 50’s kitchen, sunny window yellow. And now my lucky neighbor will receive a jar of the surplus marmalade. 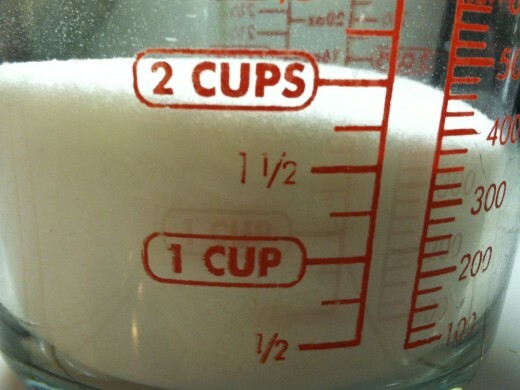 Yield: Approximately 2 1/2 cups. 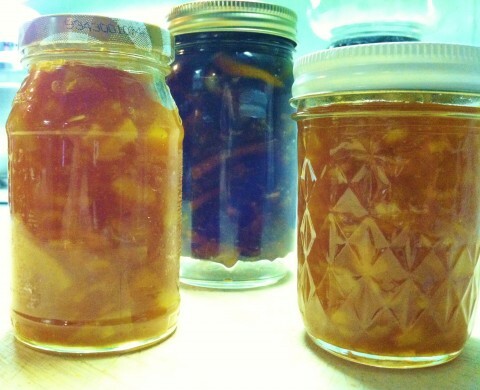 The finished marmalade can be kept in the refrigerator. Just treat it like you do a jar of jelly. Or it can be canned for long term storage. Just make sure that metal lid is sealed and doesn’t bounce back when pressed. 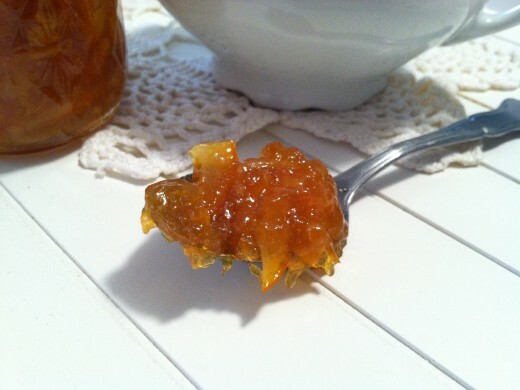 According to FitDay.com, marmalade is high in fiber, vitamin C and vitamin A.
Now…this is just about the perfect place to go for reading and eating!! Gorgeous and yum! I love this idea — can’t wait to see what other recipes come out — reading and eating — love the combo! This is amazing! The marmalade spoon scene was the first one I wrote in the short story that became THE SILENCE OF BONAVENTURE ARROW. Love this. What a fab idea to pair with this novel. And I agree, the recipe for this novel HAD to come from that scene. Thank you. Rita, I CAN’T believe that was the firs scene you wrote. That is so great! I can see how he would grow from there.